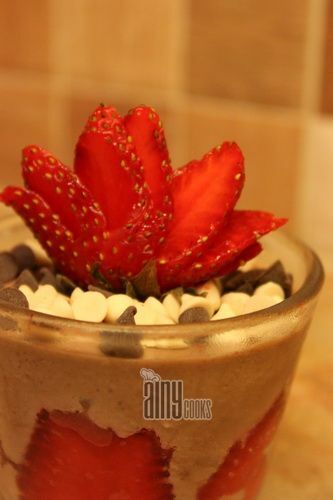 When i first time tried this recipe, i was doubted about its result but believe me i was so happy to eat this velvety smooth textured chocolate and strawberry Mousse. 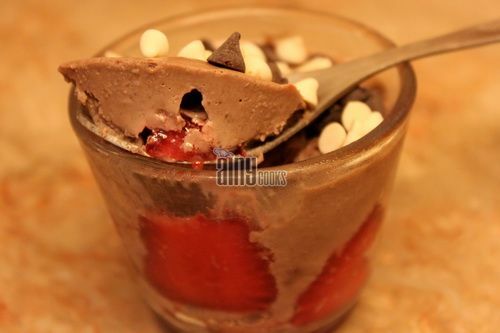 You can make this mousse it few minutes only. In a small bowl soak gelatin in 2 tbsp water. Set aside. In a large bowl place chocolate and set aside. In a sauce pan add water and sugar, cook till sugar melts. Pour syrup of sugar on chocolate and mix with whisk. Mix till smooth.Let it come to the room temperature meanwhile beat cream. Beat cream till fluffy. Add coffee liquid in cream (if you want). Beat well. In microwave heat gelatin for 10 seconds. It will become liquid mix with spoon an mix in chocolate. 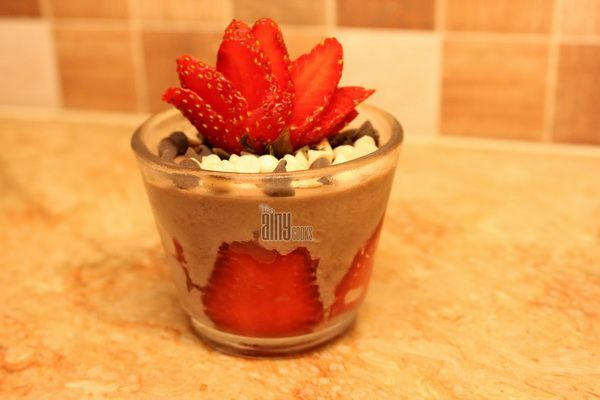 Pour chocolate mixture in cream and mix well. Mix strawberry chunks in cream with light hands. Fill in small serving glasses and refrigerate till set.